With ClickUp's Goals feature, you can create specific objectives, and easily track and view their progress. Goals are then broken down into smaller Targets. Learn how to create a Goal here. Easily monitor the progress of your Sprints. Assign the Goal to your Project Manager. Set the due date for the Goal to be the date you'd like the Sprint to be completed by. Use the task Target type to link pertinent Lists or tasks to this Goal. As you complete each "task", you'll see the Goal progress update in real time. Set up your Goal using the True/False Target type. Add one Target for each recipe. Click on each Target and mark it as finished. Set up a weekly Score Card Goal to show your team what you'll be working on throughout the week. Set up your Goal using the Target types that work best for you. Here we'll use the Number Target type for ex. Goal: Weekly Instagram posts. 2. Click on the Target and increase the # by however many Instagram you posted for the week. Add Goal "Increase profit by 25". Add and name your Target. 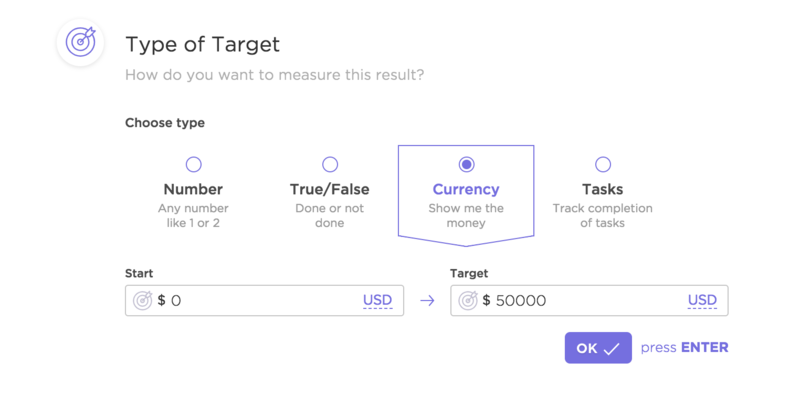 Select the Currency Target type and input the dollar amount you'd like to reach. Similarly, ClickUp's Portfolios feature gives a high-level overview of what's happening across your team. Portfolios are broken down by full Lists, however. You can easily monitor the progress and health of Lists to keep your tasks on track. Portfolio columns give you insight via Custom calculations, List colors, Task status, List Start/End date, Priority, Assignee, Time estimated, Time logged, and Time remaining. With Goals, you can create specific Targets and link specific tasks to the Goal on a more granular level.